If you don’t notice their work, then that means they did it right. The editor’s job is to make sure each scene blends seamlessly into the next without notice. They must have a keen eye for details, making sure each cut merges into the next one without the audience noticing. It takes a lot of time and patience to be a professional editor and they’re an important part of the production process. When movies were first being invented everything was shot on film cameras. This meant that to make an edit and editor would cut film strips and tape them together. Today, most movies are digitally formatted and editors no longer have to cut film strips. Professional editors now use computer programs to help them put together movies and each editor has their own opinion when it comes to what program works best. Many computers come with editing software built in, such as Windows Movie Maker or IMovie. These programs are for good for editing simple projects such as Vines and basic YouTube videos. Although they are free and easy to use, when editing something longer and more complex it’s better to go with a professional editing program. There are several different editing programs out there and it can be hard to decide which one is the right one. Here is a brief introduction to the top four editing programs being used in the industry today. Avid is in the top three of best editing programs. Popular with Hollywood editors, Avid uses a non-linear system, non-destructive editing of the source material, and can create and export videos all the way up to 5k, the best video quality available. It has fast processing speeds, 64-bit operation, and can even edit 3D material. It can be a difficult program to learn how to use but, once learned, is very fast and efficient. Avid is a go to software for professional high quality work. If you’re editing a feature length film this would be the program you’d want to use. Adobe Premiere is a widely used program because of its accessibility. Premiere is another non-linear editing system that can work with larger files. Premiere can work 4k quality footage and can be fairly quick about it, depending on the processing speed of the computer. The workflow is straight forward and can be learned pretty quickly. If you need a program that’s easy to use and functions well as part of a team, Premiere would be the best for you. 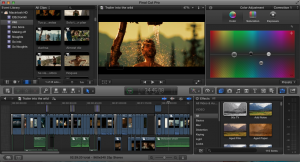 Final Cut 7 is very similar to Adobe Premiere. The main difference being, that it’s only available for Mac users. Final Cut 7 can also function with high quality footage at a decent speed. It’s a non-linear program and is fairly easy to learn. Final Cut 7 would be another good program for a first time user who’s looking for something that’s easy to learn and use. The biggest change from Final Cut 7 to Final Cut X is it does not use a traditional timeline. Generally, editing programs have a timeline to keep all the footage organized and in place. 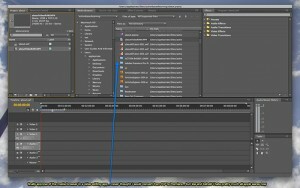 Most editing timelines create a layer for each individual file. Final Cut X created a timeline where footage can be moved around the work area freely. Otherwise, Final Cut X is very similar to Avid in that it can edit very large files, all the way up to 4k, and has 64-bit performance. 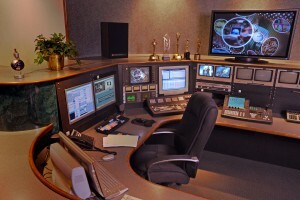 It would be a suitable program for any editor looking to make feature length films. All of these editing programs are used frequently by professionals and each one has unique features. Editing software is a very important tool used to create high quality footage. The best thing to do is try each program and see what works best for your project.